When I sat down at brunch in February 2009, I expected to have dumplings. What I got instead was so much more. As friends are wont to do, they challenged me to start doing Couch to 5K and preparing to run the Bronx Zoo Run for the Wild 5K. Not only did I run it (and besting their times), I continued running. Bigger and longer races until I reached the pinnacle, the New York Marathon. 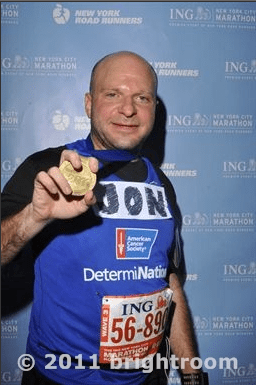 My almost two year journey culminated this past Sunday as I joined American Cancer Society’s DetermiNation team to run New York City’s five boroughs for 26.2 miles. At 5:30am, I arrived at the team bus and we all rode semi-conscious from the finish line to Staten Island, where we began to prepare in the charity village. I was placed in the third wave, which started at 10:40am, and although I had a couple hours to get ready for the race, time slid by until race time got closer and closer. With my name and my bib firmly attached to my DetermiNation singlet, it was time to go headlong into the race. Moved into our corrals based on bib color and wave, we were herded together and towards the start line. An anxious, nervous mob slowly moved forward as the gun fired and we were able to begin running. We headed out from Staten Island to the Verrazano Bridge, which we moved en masse towards Brooklyn. Regardless of how many people there were, we were able to begin start moving at a good pace and make our way over the length of the bridge, which no one urinated off the side of, contrary to urban legends prior to the race. As we approached Brooklyn, we were able to spread out and pick up pace. People lined the streets to cheer on the runners and lend their support. High fives and cheers came from the thin crowds as we moved through Park Slope. As we approached Williamsburg, the crowds became thicker and people filled the sidewalks (and spilled out into the streets), in order to cheer for the runners. Loud and raucous were the cheers as we ran past and made our way along the marathon route. Slowly the crowds thinned out again as we headed towards Queens. People continued to line the streets as we passed, and it was in Queens where onlookers began offering things to the runners. Fruit, candy, paper towels and other assorted ephemera were offered to assist us as we continued our journey onwards through the five boroughs, until we reached the Queensboro Bridge. The cheering disappeared as we moved into the narrower roadways of the bridge. The fatigue was slowly becoming evident as we were away from the masses on the bridge. Some people stopped for short breathers or to stretch when they could move off to the side of the bridge. It wasn’t until the off-ramp of the Queensboro Bridge that people reappeared, sitting in above us cheering as we moved from the iron structure onto 59th Street in Manhattan, and then 1st Avenue. The longest stretch of the marathon in Manhattan is straight up 1st Avenue, from 59th Street all the way up through Harlem and leading into the Bronx. Turning on 1st was electric. The sidewalks were crowded with people, who were steeped in rows upon rows on the sides of the road. Whatever fatigue was felt on the bridge disappeared and my pace increased. Seeing friends and family and having total strangers calling out my name with words of encouragement was a complete rush. Even as the crowds thinned out in Harlem, the charge pushed onwards to the Willis Avenue Bridge and into the Bronx. It wasn’t until I was halfway through the Bronx that fatigue began to set in again. My legs slowly tired out as we were repeatedly welcomed into the Bronx by announcers and musical accompaniments, but I was able to keep going through the loop in the Bronx and onto the Major Deegan Expressway back to the Madison Avenue Bridge into Manhattan. Most runners I have spoken to have warned me about hitting the wall when running the marathon. I had been told different stories that varied from miles 18 to 20, where it becomes harder to run but I should just push through it. For me, it was at mile 20 when my legs started to give. 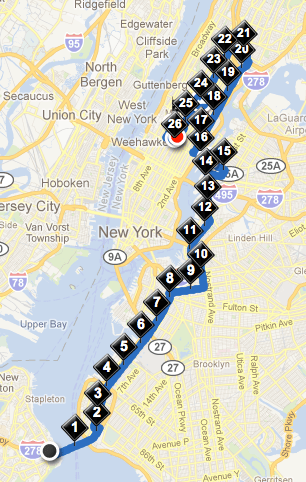 I began a mix of running and walking down 5th Avenue from Harlem towards Central Park. People continued to give me words of encouragement as I attempted to power through it. As I saw Central Park approach, it gave me the energy I needed for another boost and was able to run again as I entered the park, missing some friends and family who were cheering around that area. I could feel the fatigue start to set in again once I was in the park. Occasionally slowing down as I moved through mile 24 was tough, but I kept going. It wasn’t until I reached the mile 25 marker that I knew the finish was in sight. From the entrance to Central Park to the finish was packed with onlookers behind barricades as they watched the last parts of the race. That 25th mile marker was all the incentive I needed and ran as hard as I could. Pushing through everything and running as hard as I could for the final 1.2 mile was exhilarating as the finish line slowly came into view. 5:02:03 from when I started, I crossed the finish line and completed my first marathon. As Nike+ told me when I syncing my GPS watch, I am now part of the .1% of all people to run a marathon. 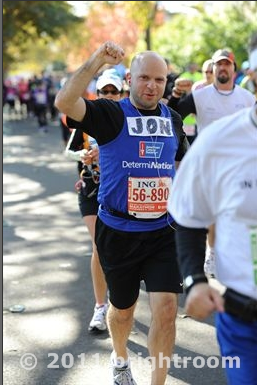 With the ING NYC marathon completed, I can focus on my remaining 9+1 races for the 2012 marathon and any other races I set my sights on for next year. I am also still raising money for the American Cancer Society. Please consider donating here. All donations are appreciated, regardless of amount!